The name of Edward Elgar is associated with the renascence of the English music at the close of 19th and beginning of 20th century. 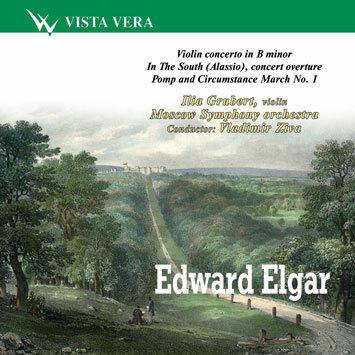 Elgar's music combines classical and romantic influences of various cultures. Despite the power and variety of those influences Elgar, like Cesar Frank or Sergei Taneev, succeeded in creating his own bright individual style. In Concerto for solo violin and full orchestra (op.61, 1910) the very concept of "the symphony for violin and orchestra" reminds of Johannes Brams. The concerto is a major work in all respects. It sounds for over 45 minutes and the part of violin is rich and diverse both as a virtuoso and cantilena work. The main theme of the Concerto, a broken and sad monologue, represents an outstanding artistic innovation by Elgar. An inimitable individual theme comes out of seemingly familiar romantic formulas. Its dramatic tensity is combined with melancholy and meditation. The first movement seems rather slow. The contrast in tempo of the sonata-kind Allegro and the second part is smoothed out. The theme of the second movement is a version of the main theme of the concerto and both themes sound in the finale (Frank uses the same device quite frequently). Thus the whole composition assumes the characteristics of a large one-part poem. A traditional cadence is not be found in the first movement, it is transferred to the central part of the finale. In the South,, a concert oveture for full orchestra, op. 50, 1904, probably reflects Elgar' fascination with Wagner, Bruckner and Richard Strauss. The main theme conveys a romantic impulse and is somehow related to the Introduction to the Third act of Lohengrin or to the main theme of the finale of the Bruckner's Seventh symphony. Episodic themes are deeply lyrical. The first episode may be associated with the delicate frailness of the late romanticism while the second is reminiscent of the pastoral archaic character in the spirit of legendary Celtic bard Ossian. Pomp and Circumstance, or Military March No 1, op.39 No1 needs no introduction. This brilliant orchestral work has become a musical symbol of Britain and is extremely popular in the country as is familiar to many people throughout the world. Violin concerto in B minor, op. 61. Ilya Grubert was born in Riga, Latvia, and having received his professional education and training at the Moscow Conservatoire won all prestigious international competitions in which he could take part. He was a prize winner at the Jean Sibelius competition in Helsinki, received the first prize at the Paganini competition in Genoa and finally the first prize and gold medal in 1978 Tchaikovsky competition in Moscow. He lives in Holland and performs in many countries of the world and with many major orchestras and leading conductors. The New York Times called him "A musician of exceptional talent in the tradition of the great virtuosos possessed an unwavering tone and extraordinary technique". Moscow Symphony Orchestra is the first privately owned orchestra in modern Russia. It was founded in 1990. The orchestra performed in the best concert halls in Moscow and Saint Petersburg and appeared in many countries in Europe, Asia and America. It recorded many compact discs including all 17 symphonies by Malipiero, all symphonies by Turnemir.Vista Vera recorded with MSO Orchestral Works by Glinka. Vladimir Ziva graduated from two oldest Russian conservatoires, in Petersburg (then Lenigrad) and Moscow. He worked with the Moscow Philharmonic orchestra and the Nyzhny Novgorod Philharmonic orchestra. He also was the chief conductor of the Mousorgsky Opera and Ballet Theatre in St.Petersburg. Since 1997 he is the chief conductor of the Moscow Symphony Orchestra. He gave over 800 concerts including 250 in foreign countries. Ziva played with outstanding musicians including Rostropovich, Gutman, Maysky, Kremer, Tretyakov, Bashmet and many others. Cover: The Long Walk by C.Gauci.